They ship quick too! 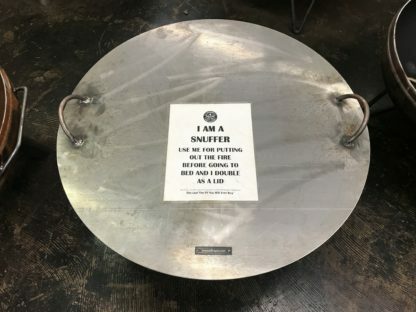 I ordered a snuffer lid for my 36". Impressive craftsmanship. Solid work and exceptional customer service when I messaged with a couple of questions. This is a great addition to a pit. I dont need to worry about the fire when we go to bed (our fire pit sits on a wood deck, so that worried me a lot). Also works as a table too. Love it. This handcrafted 36” elliptical Fire Pit sits approximately 19” off the ground. 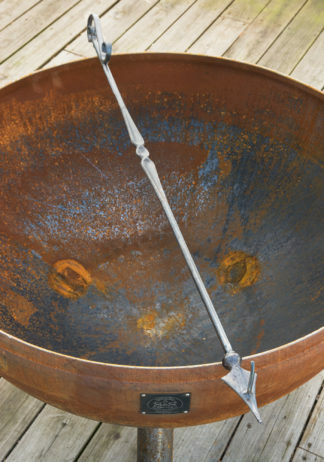 This fire pit is all hand-welded; it has a re-purposed truck rotor for a base, re-purposed railroad spikes for handles, has a 1⁄2” drain hole to keep water out, comes with a free handcrafted 46” Fire Poker. This Fire Pit is designed to easily service 2- 15 people at any gathering.